General Meeting, Program on "The Real Molly Pitcher." 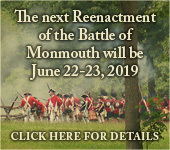 Starts at the Battle of Monmouth Monument on Court Street in Freehold. Then visit two important seldom seen areas of the morning portion of the battle, the East Morass and Briar Hill. Meet at 1:30 PM at Visitor Center. Bird Walk on the battlefield. Identify birds that live here or pass through in the spring, Meet at 9 AM at the Visitor Center. Driving tour to visit the site of the American encampments at Ponolopon Bridge the day before the battle of Monmouth. 241st Anniversary of the Battle of Monmouth. Held at 1:30 PM in the Visitor Center Auditorium. Meet at Visitor Center at 2:30 PM. Special program on “Alexander Hamilton’s Military Service, Spanning 25 Years,” by Rand Scholet of The Alexander Hamilton Awareness Society. Held at 1:30 PM in the Visitor Center Auditorium. Followed at 3 PM by battlefield tour of sites associated with Hamilton at the battle. Driving tour to the battle of Monmouth Monument on Court Street in Freehold. Meet at Visitor Center at 2 PM. Program on the role of the New Jersey Troops in the the Battle of Monmouth. Memorial services to honor Major Peter Vredenburg and NJ Governor Joel Parker. 4:30 PM at Maplewood Cemetery, West Main Street in Freehold.